A rookie New York firefighter who plunged to his death off a highway bridge while rushing to rescue a man trapped in an overturned vehicle had bravery ‘in his blood,’ Fire Commissioner Daniel Nigro said at his funeral Friday. 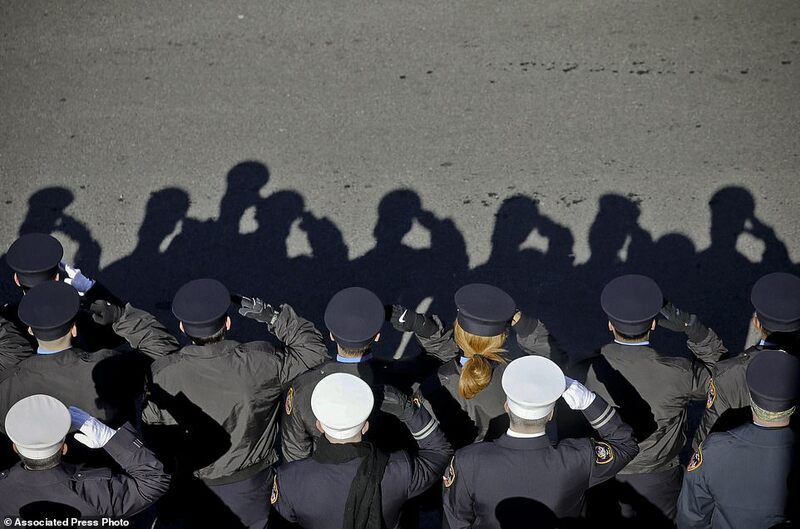 Before the service for Steven Pollard, thousands of firefighters from the city and around the country stood silently in dress uniforms on a street of red brick homes near the Good Shepherd Roman Catholic Church in Brooklyn’s Marine Park, where he was raised. 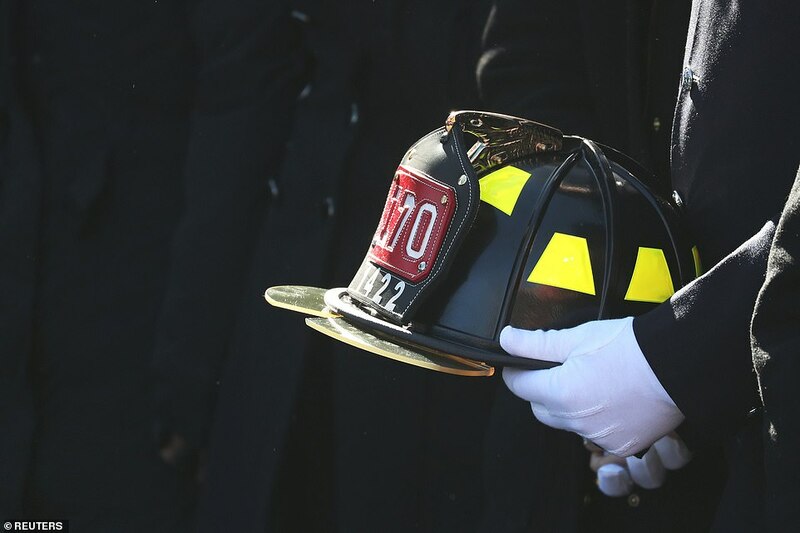 Late January 6, the company responded to an accident on Brooklyn’s Belt Parkway. Working in the dark on the cold, windy night, Pollard was running toward the vehicle that had flipped over when he fell into a gap between bridge spans and plunged about 50 feet. 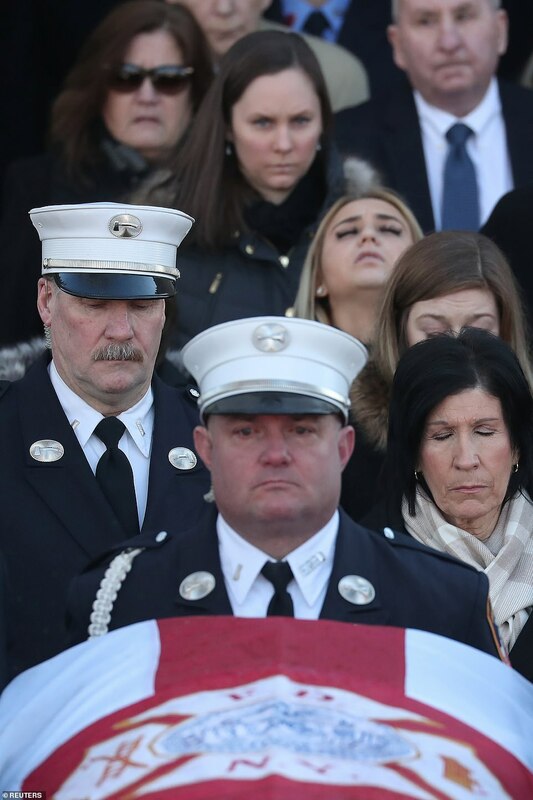 ‘On Sunday, what Steven Pollard saw was a fellow New Yorker, a fellow human being in a crumpled SUV,’ Mayor Bill de Blasio told mourners. 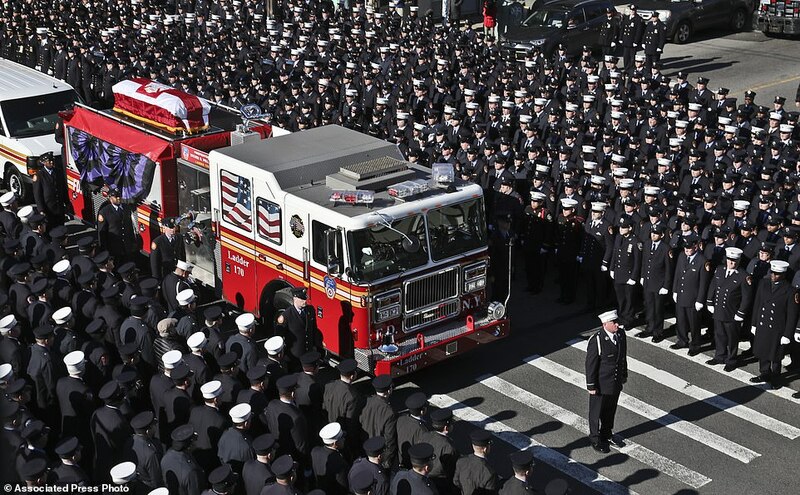 Pollard joined the Fire Department of New York only a year and a half ago and had just passed his FDNY probation ‘with flying colors,’ said Ladder 170 Capt. Jimmy Quinn. Pollard’s helmet was presented to his family. 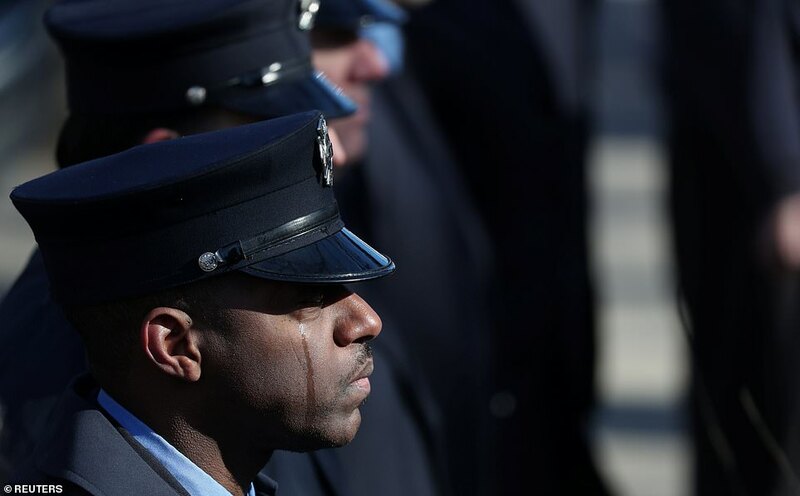 His father, Raymond Pollard Sr., retired after 32 years in the FDNY, and his brother Raymond Pollard Jr., is still serving after 11 years. 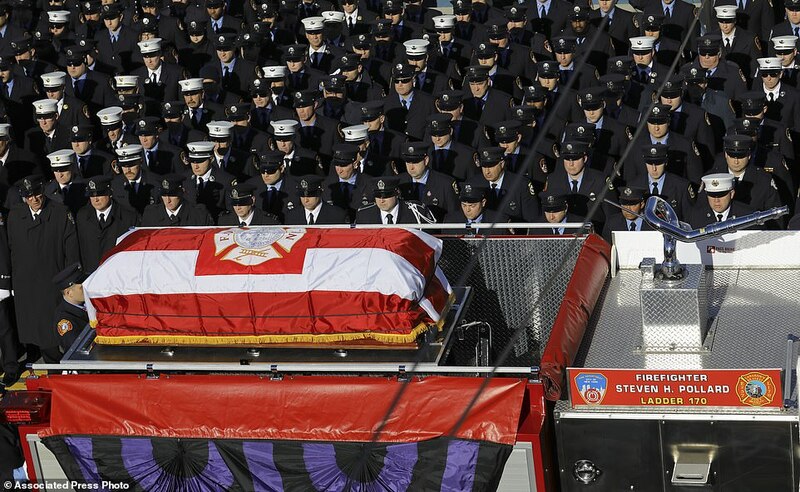 ‘This family will always be a part of our family,’ Nigro said. 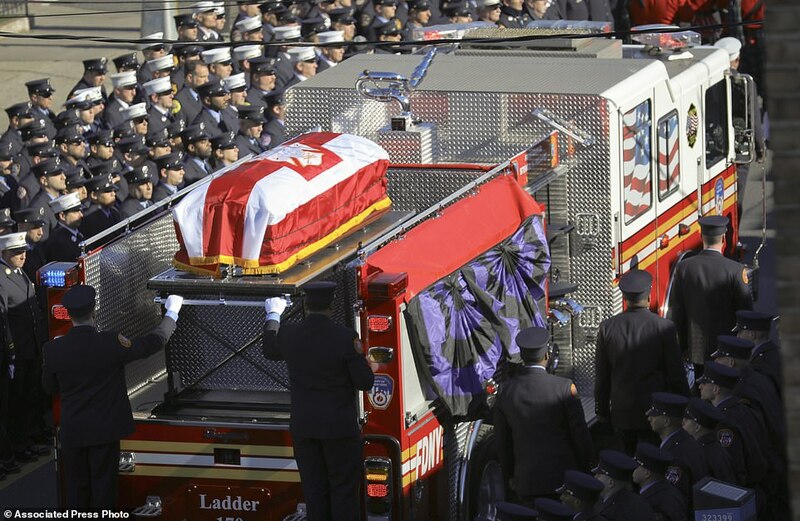 Pollard was the 1,151st fire department member to die in the line of duty in New York. The city has about 11,000 uniformed firefighters. On Wednesday, hundreds of mourners gathered for Pollard’s wake. 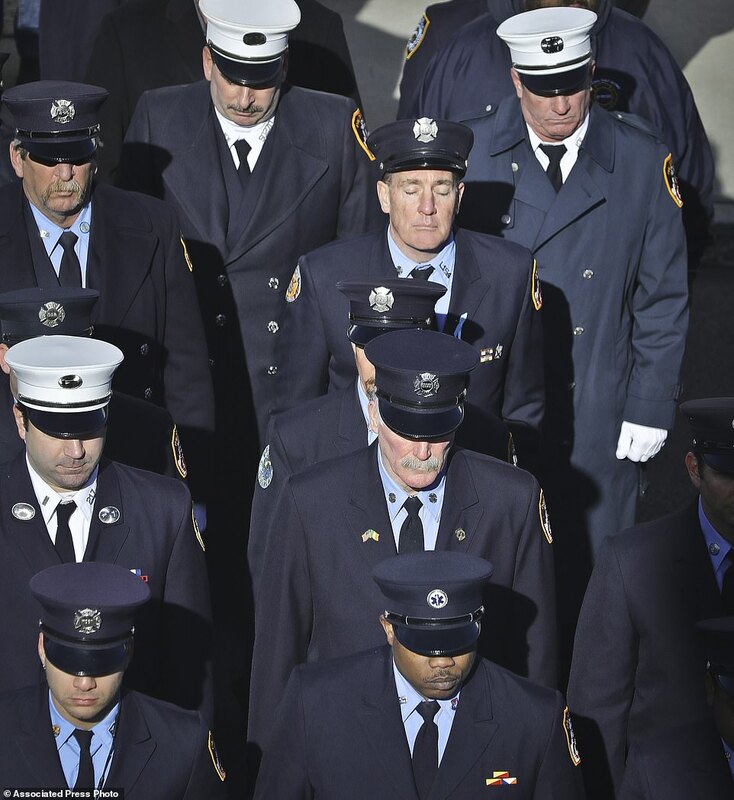 The tragedy rippled through New York City’s fire department, who are now mourning the loss. Wednesday night marked the start of three days of services for Pollard. 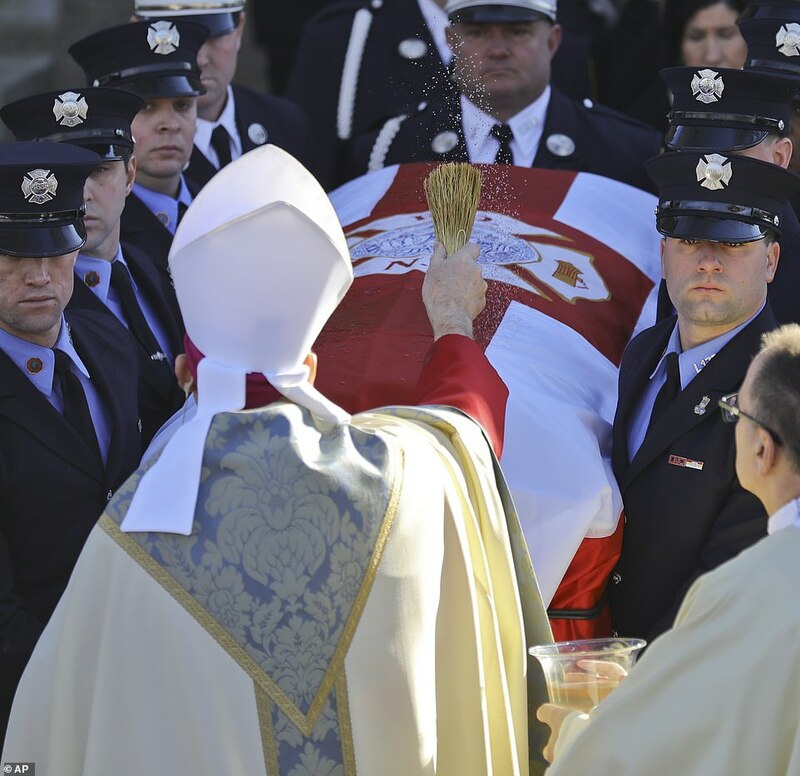 ‘At a time when people are tempted to get cynical and wonder where our heroes are, where sacrifice and selflessness is, all you’ve got to do is think about Steven Pollard,’ said Cardinal Timothy Dolan. The wake at Marine Park Funeral Home continued Thursday from 2 to 4pm and 7 to 9pm. On Monday, an emotional bunting ceremony was held to honor Pollard. 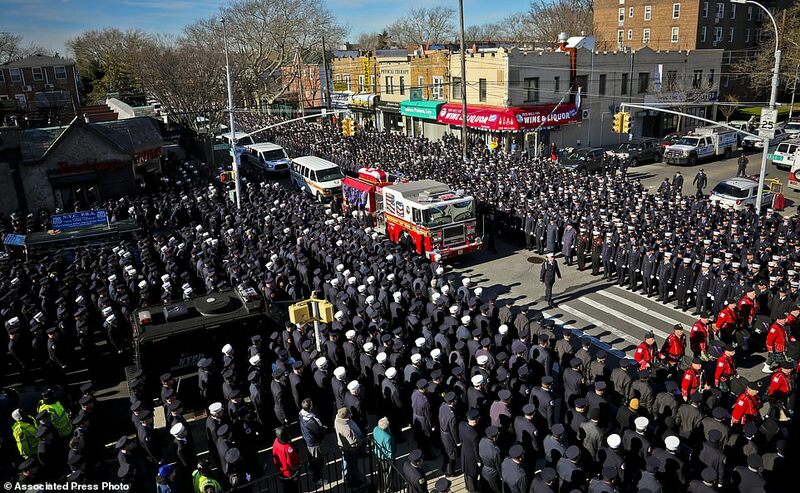 Hundreds of FDNY officers, community members and loved ones gathered in Canarsie to honor 30-year-old probationary officer. Pollard had been walking between the carriageways of the Mill Basin Bridge on Sunday when he tragically tumbled 52 feet through a 3 foot-wide gap that he attempted to climb over. He was trying to rescue Travis Simms, 30, who was trapped in his wrecked Ford Explorer. The bridge, which was originally solid the whole way across, was recently rebuilt to include a gap between each side of the road. 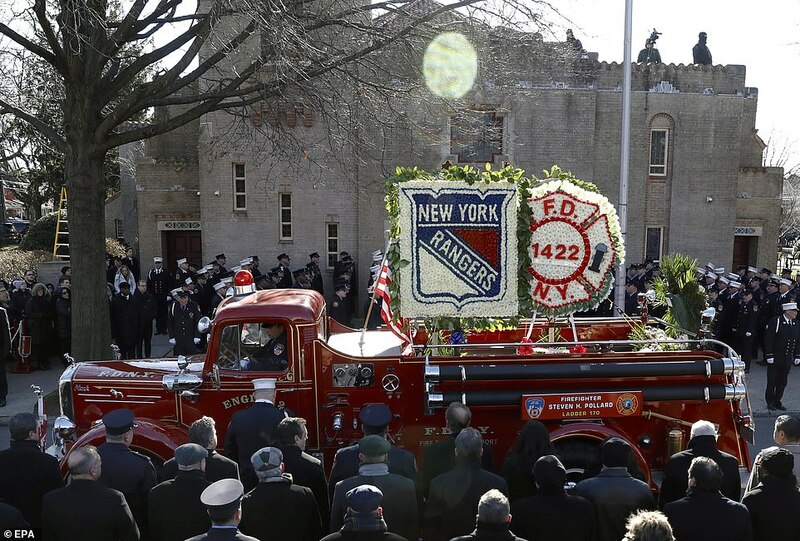 The ceremony took place outside Ladder Company 170 in Canarsie, where the American flag hung from a ladder truck as ‘Amazing Grace’ played. 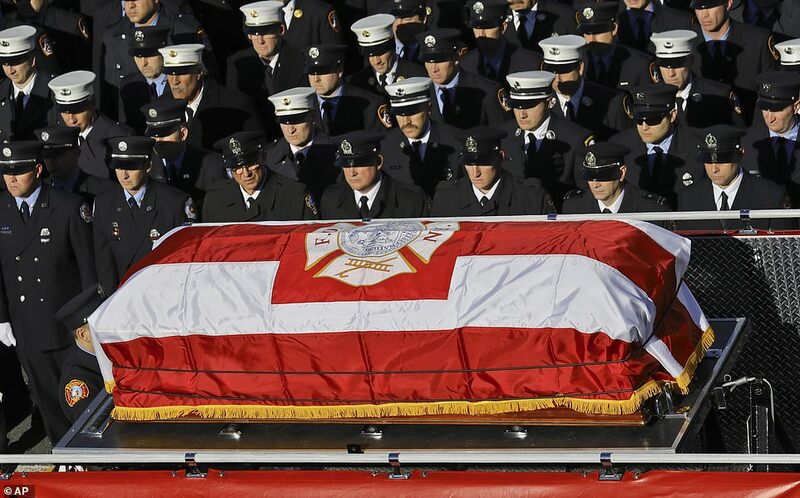 Pollard was remembered throughout the community Monday as a hard-working and ‘model’ firefighter. 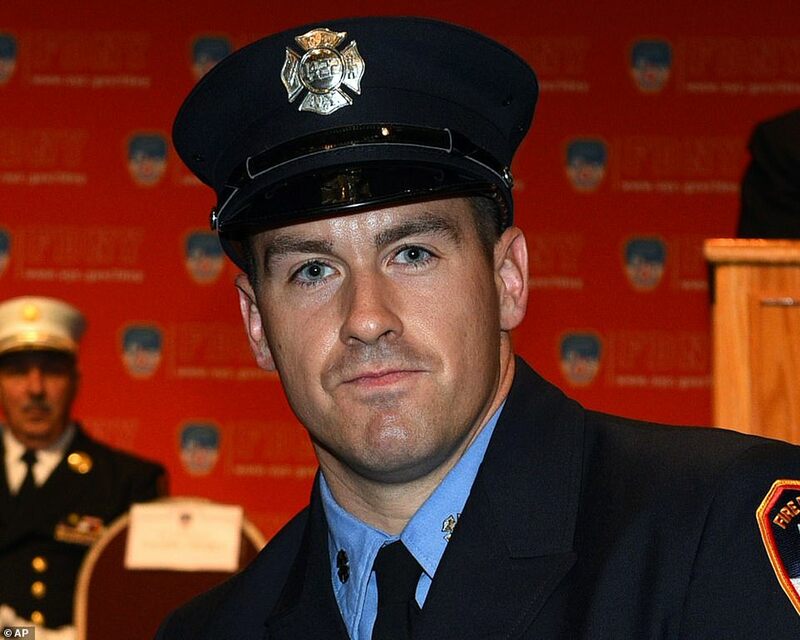 Captain James Quinn said: ‘Steven Pollard came to us in November of 2017, out of probie school. ‘He was the model probie. Any job we gave him, he accomplished it. Any task we asked him to do, he did it well. 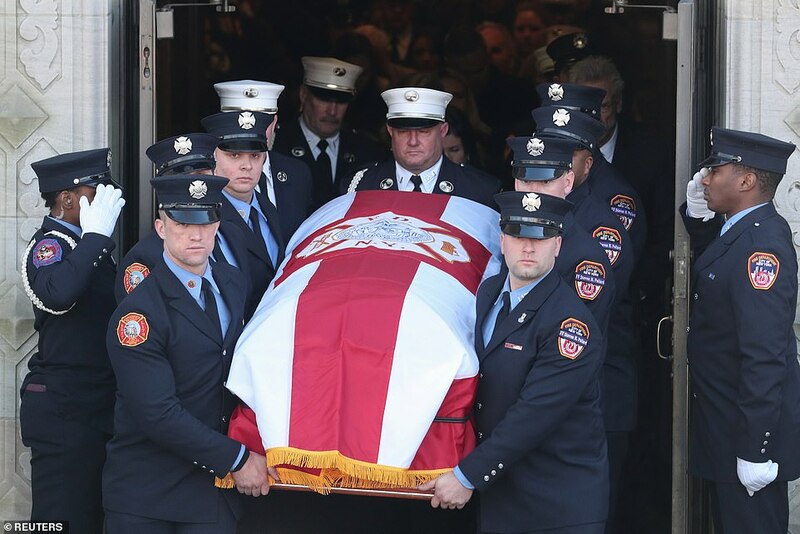 The late Pollard comes from a family of firefighters, including father Ray Pollard, of Ladder 102 in Brooklyn and his brother Ray Pollard Jr., who is an active member of Ladder Company 114. He is also survived by his mother.